I love a strawberry buttercream recipe is made from fresh strawberries! When strawberries are fresh, juicy and warmed by the sun, there’s nothing like it! You can harness this flavor by growing your own, going to a you-pick strawberry farm or you can buy frozen strawberries. Frozen strawberries are usually picked at the peak of ripeness (is ripeness a word) and then flash frozen to seal in that flavah. You can freeze strawberries yourself or you can even can them. Something I definitely want to try at some point! 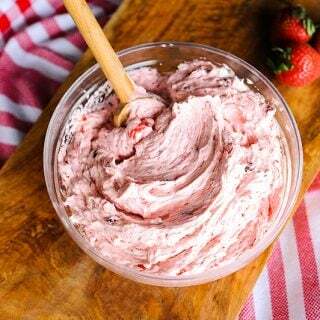 To make a strawberry buttercream recipe successfully, the best way to start is with some yummy strawberry puree. 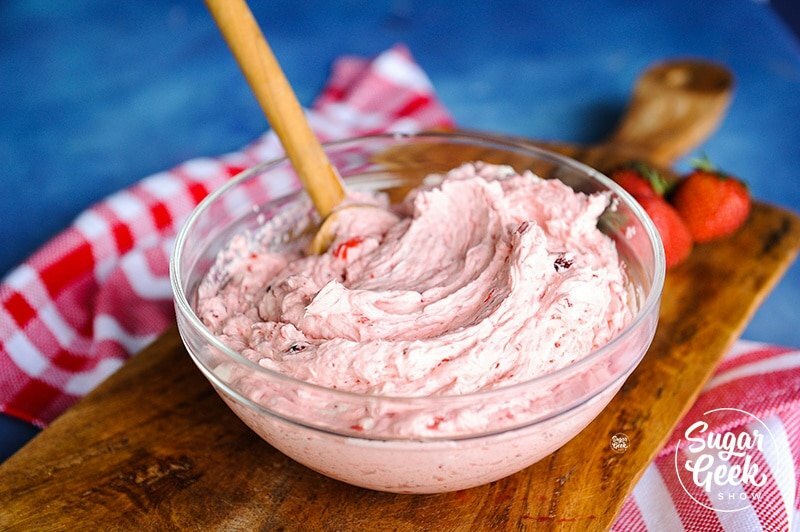 The best strawberry puree is made from fresh strawberries or frozen that have been reduced so that there is not as much liquid in the strawberries but you still get all that delicious strawberry flavor. I like to add in some lemon zest to up that strawberry zing. You got yourself some delicious, sweet, packed with strawberry flavor buttercream! This strawbery buttercream recipe pairs so well with so many cake flavors! Lemon cake, vanilla cake, even chocolate cake. Strawberry buttercream made with fresh strawberries that is sweet, juicy and so easy to make! Combine 2 cups room temperature puree and zest with buttercream. Fold together to combine. Because this buttercream has fresh fruit in it make sure it stays refrigerated. 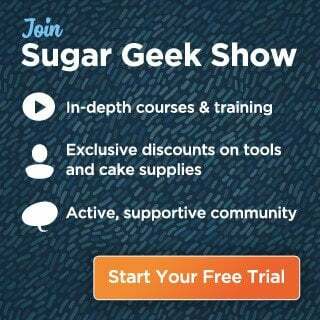 Store excess buttercream in the fridge or freeze for up to 6 months. Defrost buttercream in the fridge and re-whip before use. Would this recipe be the same with other berries like blueberries or raspberries? Is it 1 cup of strawberry puree or 2 cups? In the ingredients list says 1 cup but in the instructions indicates 2 cups. Hi, just to double check, are all the quantities in the ingredients list for a single batch – so 1 cup puree, 1 cup egg whites, 2lbs sugar, 2lbs butter etc? Thanks. Hi – where it says ‘Optional: switch to the paddle attachment and mix on low for 15-20 minutes until all air bubbles are gone,’ what is the effect of this? Thanks. Hi there, how much icing would this recipe yield? I want to ice an 8″ round cake but have no idea if this is enough/too much icing and if it may be worth halving the recipe to save wastage. You mentioned on your strawberry cake made with freeze dried strawberries blog that you used freeze dried strawberries in this strawberry buttercream (lots of strawberry, lol). I’m assuming you replaced the puree with the freeze dried strawberries, but how much did you use? Thank you. Hi! I am a cottage baker. With the fresh fruit in this one, i would not be able to use it, because it must be refrigerated. Do you have any suggestions for what I could use? Try my other strawberry cake recipe that uses freeze dried strawberries. I feel that 2lbs of butter is alot for a 2 layer cake. I just want to make sure I was reading this right- 8 sticks of butter and about 8 cups of powdered sugar? Do you normally have left over frosting? I’m excited to make your strawberry cake this weekend. Please use weight. It is 2 lbs of powdered sugar, not cups. And yes the butter is correct. If you have leftovers you can freeze them.